Daiton Paszczak of Algoma got his first wild turkey in a Learn To Hunt program in Kewaunee County last weekend. Submitted photo. Thousands of Wisconsin youths will get a head start on the spring wild-turkey hunting season this weekend. 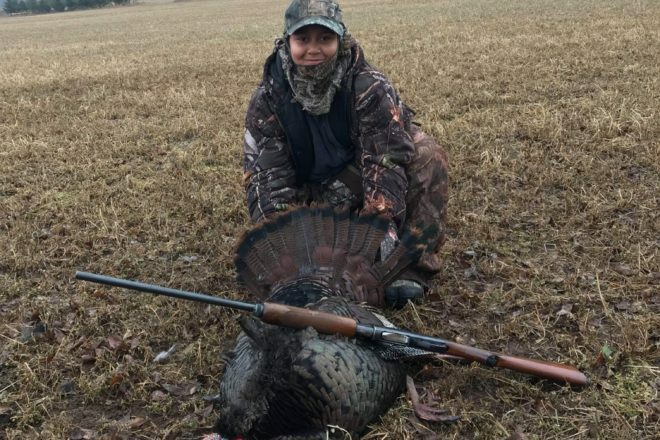 The special weekend for hunters ages 12 to 15 began in 2007, and it’s designed to give youth an opportunity to hunt without competition from adults. Youth must have drawn a spring tag or purchased a leftover permit to participate, and they must be accompanied by an adult. Youth who do not get a bearded bird during this hunt may hunt again during any spring hunt period for which they have a tag. Young hunters must have completed a hunter-safety education course unless they are participating under the mentored hunt program. Those younger than 12 must participate under mentored hunt rules, even if they have successfully completed hunter education. Youths may harvest only one bearded turkey during the youth hunt, even if they have more than one permit for Zone 2 this spring. Harvest authorizations filled during the youth hunt may not be reused to harvest an additional turkey during the regular hunting season. An adult may not accompany more than two youth hunters during the youth hunt at any given time, and it’s one-to-one in mentored-hunt situations, with the adult within an arm’s reach of the mentee at all times. See all the rules for the youth hunting weekend at dnr.wi.gov/topic/hunt/documents/turkyouthhunt.pdf. Meanwhile, the first of six seven-day spring wild-turkey hunting periods begins April 17 for hunters who drew first-period tags. The gobblers, jakes and bearded hens are still bunched up in many areas, making scouting prior to the hunt essential. After that, surviving toms will still be seeking out receptive hens, but where hunting pressure was heavy, they may become call shy. Hunters who know where the birds like to strut, feed and roost will do best, patiently hiding in cover or a blind. There are still leftover permits available in Zone 2 for Door and Kewaunee County hunters, but only for the sixth (final) week of May 22-28. Several groups sponsored Learn to Hunt wild-turkey events the past two weekends, and some will continue this weekend. The hunts are one-to-one mentored for beginning youths or adults. Learn to Hunts are also held for pheasants, waterfowl, deer, bear and more. Check the list throughout the year at dnr.wi.gov/education/outdoorskills/lth.html. The Great Wisconsin Birdathon 2019 – a joint effort of the Natural Resources Foundation of Wisconsin and the Wisconsin Bird Conservation Initiative – begins April 15. Anyone can join. It can be a fundraiser for an organization, a team-building exercise for coworkers or a learning project for a family or classroom. Every pledge and donation raised supports bird conservation and research projects in Wisconsin and beyond. Here’s how it works: your team counts birds any day from April 15 to June 15 for a morning or evening or as long as 24 hours. This year’s goal is to raise $90,000 for bird protection and research in Wisconsin. Between field trips and early team fundraising, nearly $24,000 had already been raised as of earlier this week. The Great Wisconsin Birdathon has garnered more than $400,000 for bird protection since 2012, including more than $88,000 in 2018 alone. Register a team (even if it’s just one person), donate, read about the projects the Birdathon supports and learn more at WIBirdathon.org. The 31st annual Baileys Harbor Brown Trout Tournament runs April 25-28, with fishing allowed in all Door and Kewaunee County waters. Tickets ($25) are on sale at Hooked Up Tackle in Algoma, Baileys 57, Baileys Harbor Town Marina, Baileys Harbor Visitor Center, Cornerstone Pub, AMA Archery Bait & Tackle, Why-Lee’s Bar & Grill, Dyckesville Kwik Stop, Mink River Basin, Kewaunee Marina, Jungwirth’s Ace Hardware, Greystone Castle, Howie’s Tackle, Virlee’s Gunworks and Kap’s Marina. More than $7,000 in cash and prizes will be awarded to the anglers who catch the top 40 heaviest brown trout. Weigh-in sites include Baileys 57, Howie’s, Kap’s and Hooked Up Tackle Shop. To learn more, visit BaileysHarbor.com, email [email protected] or call 920.839.2366. Rainbow trout and suckers are on spawning runs in Lake Michigan tributaries, and a few spawning smelt could be seined or dip-netted in the lakeshore shallows after dark sometime during the next week or two. Brown and lake trout are cruising the lakeshore shallows, where they may hit spoons or stickbaits trolled behind planer boards, flatlined or even cast by a wading, shore or pier angler. Ice is breaking up on the bay side. Anywhere fishers can get a line in – Sturgeon Bay, for instance – they’re casting or trolling for walleyes and northern pike. Don’t forget that last year’s licenses expired March 31. Get your new, 2019-20 license and trout and salmon stamps at the Sturgeon Bay DNR Service Center or any other licensing agent, or online at gowild.wi.gov. Whitetails Unlimited’s Packerland Deer Camp in Green Bay is sold out, but the organization is holding a number of other deer camps and banquets around the state this month. Find the list at whitetailsunlimited.com.